How did Anti-Semitism become politically correct? A dangerous worldwide coalition of Islamic terrorists, well-intentioned but misinformed students, right-wing fascists, left-wing ideologues, academics, feminists, European politicians, journalists, and international human rights organizations have joined together to again scapegoat the Jews and the Jewish state for crimes they did not commit and for whatever ails the world. 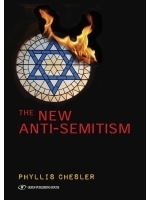 In this intensely passionate and compelling book, the best-selling and prize-winning Jewish feminist author Dr. Phyllis Chesler demonstrates how old-fashioned anti-Semitism – now often seen in the form of anti-Zionism – has become fashionable and even politically correct, and how this plague threatens the Jews of the world, Israel, America, and Western civilization. This work is designed for a mass audience as well as for a more advanced one. It is an excellent source book for pro-Israel advocates, legislators, organizations, and for laypeople of all faiths who might otherwise have no access to this information. The 2003 edition of this book was a pioneering work that has stood the test of time. This new edition updates, expands, and strengthens the original analysis and also has a new introduction, resource section, and the answers to the twenty most frequently asked questions.